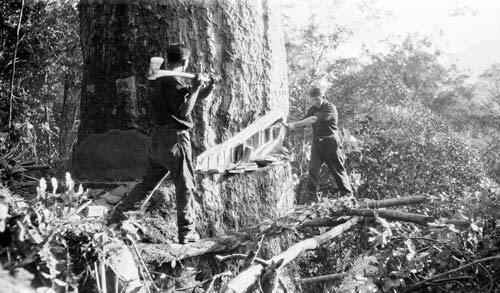 Two men begin the arduous work of logging a giant kauri tree by cutting a ‘scarf’ (a wedge shape) on the side where the tree is intended to fall. Next they will saw through the trunk from the other side. In the 19th and early 20th centuries much of New Zealand’s native forest was felled in this way. Kauri, which grew mainly in Northland and the Coromandel Peninsula, was particularly sought after for its strong but light timber, and large quantities were exported. Permission must be obtained from The Kauri Museum before this image is stored, reproduced, or altered in any form for any purpose.